Craftivate concluded summer photography classes with a public exhibition in August. Taught by the amazingly talented local photographer, Elizabeth Grant, high school and adult students went through six weeks of classes. Elizabeth covered everything from the basics of your camera to composition and editing. In the end, students chose 7-10 of their best photos to be printed and showcased. With a little rearranging, Elizabeth was able to turn the studio into quite the gallery. 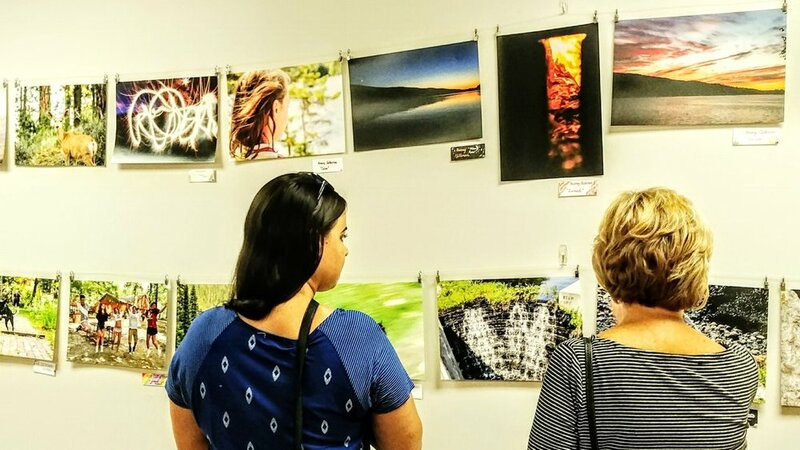 With rows of photos gracing our walls, chairs set up in the center of the room to create that perfect gallery feel, and stellar wine from Southern Connecticut Wine Company, we were excited to open our doors to the public. Many of our photographer’s final works were sold allowing Craftivate to donate to a cause near to our heart, the Closer to Free Ride for Smilow Cancer Hospital. At the peak of the exhibition we had around forty people in attendance and raised over $400. Though six weeks of photo class just skims the surface of understanding this complex and beautiful art form, it’s clear that our students were able to apply their new skills and understanding to create beautiful photographs. Thanks to everyone who attended and donated, and to the artists who shared their work with the community! Please check out the Craftivate Events Page for more information about our photo offerings or go to our Tickets and Booking page to sign up now.